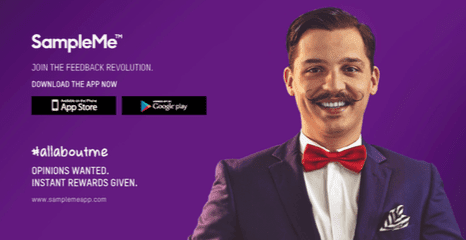 Katch International is delighted to announce it has been appointed by SampleMe to launch its brand new app into the UAE market. Katch will be utilizing its full range of expertise, including Design and Branding, PR and Communications, Digital Strategy and Marketing in order to ensure maximum impact and consumer engagement for this exciting new brand. The brainchild of digital guru, Ryan Singlehurst, SampleMe was created to be the ultimate thought engine, providing a totally unique new method of social search that will appeal to the consumer and an innovatively effective marketing tool for brands. Katch International will be responsible for ensuring the local and regional discovery of this reward based application and providing a comprehensive launch strategy. The unique nature of the app and its capabilities will require dual B2C and B2B campaigns in order to raise brand awareness. it’s #allaboutme. The app allows you to earn instant free gifts, discounts or prizes just for taking a quick 20 seconds to give your opinion, good or bad. That’s about the same time it takes to instagram your main course! It can also tell you what your friends thought of somewhere and where the hottest new place is. “The app was born from a passion to give, a love to get and a desire to share. Traits we can all empathise with!” said CEO Ryan Singlehurst. “We are delighted to be launching SampleMe in the Middle East market, particularly given the discerning calibre of consumers in this region and the natural culture of sociability that makes the UAE one of the best countries in the world!” How it works – Give Today, Get Today for doing the things you love! Download the app for free and it will notify you when you enter a restaurant, store or venue in the SampleMe community. You can then choose to answer a 20 second survey, post a picture or write a quick review. Tell the venue about your experience, what you’ve enjoyed or what you haven’t. Because the app works in real time, the rewards do too. Claim your instant free gift or choose to save your points and redeem them against a super sample prize; take your pick from an hour in a Ferrari, a wakeboarding lesson, a Flyboard session, a professional photoshoot, an HD Brows treatment or eyelash extensions. Care what other people think? Perfect. The innovative social search structure of SampleMe allows you not only to share your reviews with friends, but also see what places your friends would recommend, which places they didn’t like and where to get the best deal! So it’s like having a search engine you actually trust (unless your friends have really bad taste!). There is even a ‘Pay It Forward’ function where you can send your friends a discount code so they can enjoy the places you loved the most! DOWNLOAD THE APP NOW The SampleMe app is free and easy to use. Use it to review the places you go and get free stuff just for giving your opinion. It will revolutionize the way you share and experience the things you love. The future of feedback is here!